It’s the classic story of a high school nerd that’s in love with a girl that’s way out of his league. Stan’s a geeky guy who just can’t stop thinking about Kelly, the school’s star cheerleader, and needs to show her how much he loves her. But Stan will need to put on quite a show to get Kelly to notice him, let alone go out with him! Will Stan’s nerdy charms work on this blonde beauty? Find out if the geek gets the girl and wins big in Beauty And The Nerd! 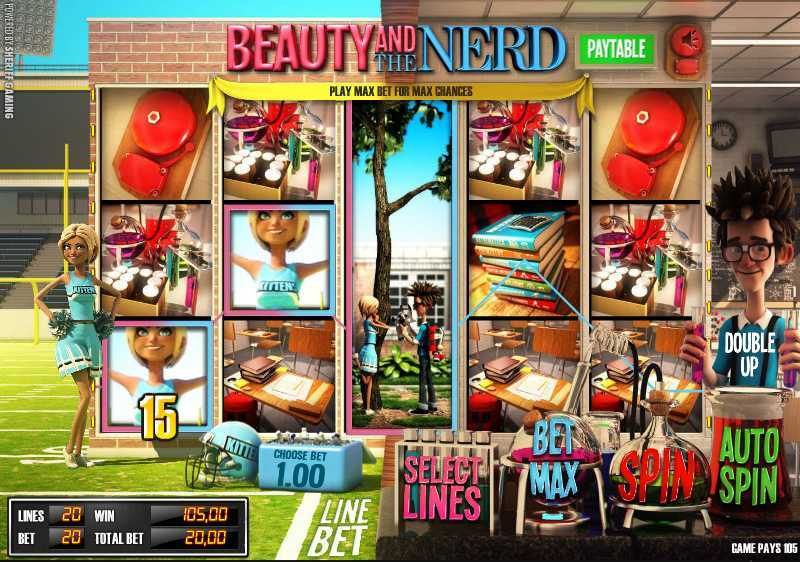 ComeOn Casino :: Beauty and the Nerd 3D slot game - PLAY NOW! When you get the special Beauty and Nerd bonus symbols (marked with a kiss) in this exact order on reels 2 and 4, you’ll witness a magical moment between them and win some extra cash! To win the extra cash bonus, both symbols must be on the same row with the Beauty bonus kiss symbol on reel 2 and the Nerd bonus kiss symbol next to her on reel 4. There are two different bonus feature games in Beauty and the Nerd. When you get 3 Beauty bonus symbols on the reels, you’ll play the bonus round in the Beauty’s bedroom. Or, when you get 3 Nerd bonus symbols, you’ll play the bonus round in the Nerd’s bedroom. In both rooms, there are 20 different items that hide prizes of either credits or multipliers. Click on the items to reveal what prizes you’ve won until you’ve selected all 20 items successfully or until you see the word ‘COLLECT’, which will end your bonus round. The Expanding WILD feature is a very special one. When you see a WILD symbol appear anywhere on the 3rd reel, it will expand over the entire reel giving you a WILD middle reel. This means you will have 3 WILD symbols on the middle reel, giving you much higher odds for getting winning combinations. If you happen to get a WILD symbol on the 3rd reel and also win a bonus round on the same spin, then you’ll first play the bonus round and then the WILD symbol will expand over the 3rd reel. Any winning combinations that are completed by the WILD symbols on the WILD reel will be paid out handsomely at the regular payout rate. Check the PAYTABLE in the game for a complete list of winning combinations that can be combined with a WILD symbol. During the game, keep an eye out for CLICK ME symbols to appear on the reels. When you get 3 or more CLICK ME symbols scattered anywhere on the screen (they do not have to appear on the same active win line), the CLICK ME game will start. Once the CLICK ME game starts, simply click on the CLICK ME symbols to win prizes ranging between high, higher and the highest amounts. You can keep selecting different CLICK ME symbols to win more prizes. But, when you pick a CLICK ME symbol that reveals the word COLLECT instead of a prize, the game will end. This game has a “Double Up” feature that gives you the chance to double every prize that you win. When you win a prize, you will see a “Double Up” sign appear that you can click on to start the “Double Up” game. The Double Up game will continue until you either make an incorrect guess or you click on the “Collect” button. When the Double Up game ends, you will return to the regular game and any credits you won will automatically be added to your balance. Beauty and the Nerd :: You can try this NEW 3D Slot game right now at the following casinos: Tropezia Palace Casino and ComeOn Casino.